Thanks to the Team-BHP fan (he prefers to remain anonymous) who sent this image in. Heartfelt gratitude for sharing it with other enthusiasts via this page! The upcoming Maruti Suzuki Ciaz facelift will have a speed alert system and seat belt reminder for both driver and front passenger. 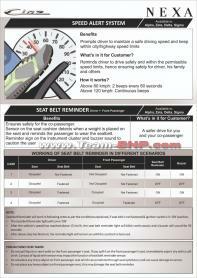 These safety features will be available across all variants of the new Ciaz. 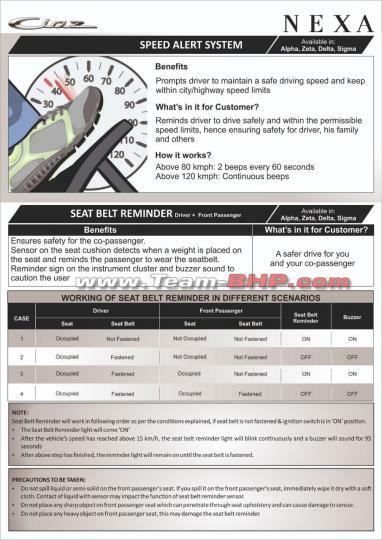 According to a leaked document, the speed alert system reminds the driver to maintain a safe speed. If the driver exceeds 80 km/h, the system prompts with 2 beeps every 60 seconds. Above 120 km/h, the system makes a continuous beeping sound. A similar system is also available on the Vitara Brezza. The new Ciaz is expected to be launched later this month. Meanwhile, Maruti has already started accepting bookings. The new model will feature revised exterior and minor interior changes. It is likely to be offered with a 1.5-litre, 4-cylinder petrol engine in addition to a 1.3-litre, 4-cylinder diesel unit. 5-speed manual and 4-speed automatic transmissions are expected to be offered at launch.